I've got a lone Teaninich to review now. Why? Because I didn't have anything else to get me to 100 reviews(!). 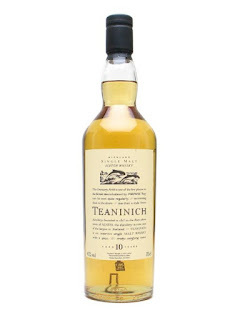 I've only tried 2 Teaninich's but the other was one of the worst single malts I've ever tried! Nose: Pretty typical. Light fruit, green apple and pear, lots of maltiness, toffee, some vanilla. Some spirity alcohol and feints. Taste: Soft arrival, prickling spice and a little alcohol. Lots of malt, toasty oak, ginger snaps, green apple, pear. Again, a little feinty. Finish: Medium length. Unpleasant bitter green oak. Notes: A little feinty, esp. the finish. Not terrible like the 1993 I had, just a little average and feinty.